You are cordially invited to a get-together dinner with the UTAR President, Senior Management staff, lecturers, staff and fellow alumni. 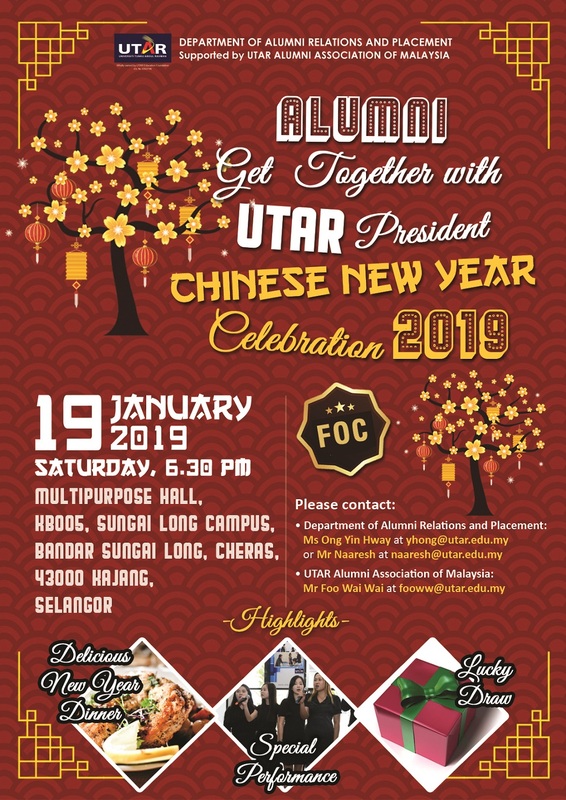 This gathering provides you a chance to network with other UTAR graduates and to meet UTAR President Ir. Prof. Academician Dato' Dr. Chuah Hean Teik and the senior management. During the gathering, you will meet other UTAR graduates who are currently employed in international organizations and professionals in respective fields of work. You will have a chance to meet them and network for future career options. We also encourage you to provide feedback and suggestions for further improvements. Your support and attendance is invaluable and we encourage you to invite your UTAR alumni friends and ex-classmates to attend as well. Looking forward to meeting you at the gathering.